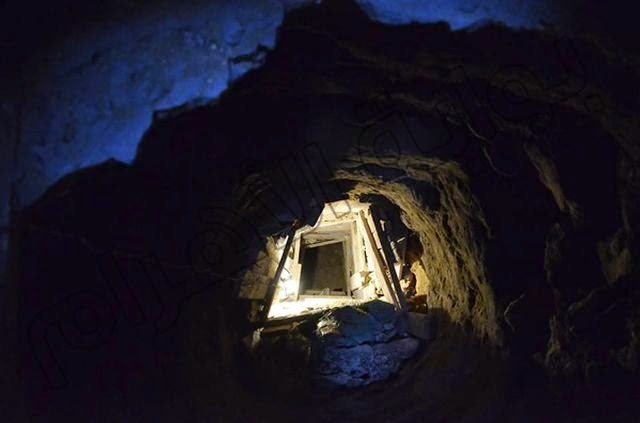 An Egyptian citizen, identified as "Nagy" by Arabic news site Ahram.org, was illegally digging in his backyard when he found a tunnel leading to the Pyramid of Khufu. The pyramid, nicknamed the Great Pyramid, is the oldest and largest of the three Giza Pyramids. Nagy, a resident of the El Haraneya village, near the Giza Plateau, dug 33 feet beneath his house before he found the corridor, made from stone blocks. Egypt's Ministry of Antiquities sent archaeologists to the scene, and a committee confirmed the passage to be the pyramid's legendary causeway. Archaeologists have searched for decades for the passage to the pyramid. The causeway is mentioned in the Histories by the Greek Herodotus, who claims to have visited it in the fifth century B.C.E. Herodotus wrote that the passage was enclosed and covered in reliefs, but before Nagy's excavation, only small remnants of the causeway had been found. The Khufu pyramid complex is known to have connected to an undiscovered temple near the Nile River. Thanks to the new discovery, archaeologists believe the temple may be buried beneath the village of Nazlet el-Samman. I would love to follow this up and see what they actually admit they find, but probably won't hear anything about it except some media lies. It depends upon how many of his grubby paws Zahi Hawass can put on whatever is there before any REAL scientists get to examine it.